We reprint below a 20 October supplement to Espartaco No. 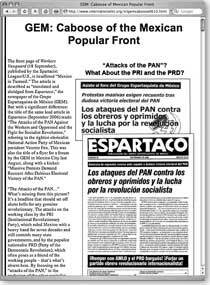 26 (September 2006), newspaper of the Grupo Espartaquista de México, section of the International Communist League. The Internationalist Group (IG) was never known for its concern for the truth, but now it has burrowed to new depths in the dunghill of lies. 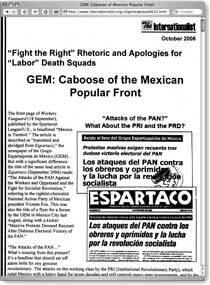 Their new article titled Fight the Right Rhetoric and Apologies for Labor Death Squads—GEM: Caboose of the Mexican Popular Front (The Internationalist online, October 2006) is a campaign of slanders for use in circles hostile to Trotskyism, directed against the Grupo Espartaquista de México (GEM), section of the International Communist League. Whereas Stalin had Trotsky airbrushed out of photographs, the IG, with a click of the computer mouse, doctors its Web site from one day to the next in a guilty cover-up. Their article is designed to be read not in Mexico but is for international consumption. Not only is it not available in Spanish, when it was first posted, some of their comrades in Mexico didnt even know that their líderes máximos in New York had written it. And they have the nerve to charge us with imperialist arrogance! In a crude attempt to paint us as acolytes of the bourgeois PRD [Party of the Democratic Revolution], the IG cut in half the front page of Espartaco No. 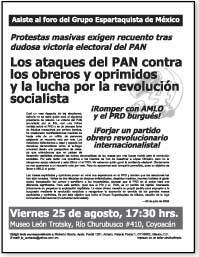 26 (September 2006) and a Spartacist [GEM] forum leaflet, disappearing our call to Break with AMLO [Andrés Manuel López Obrador, PRD presidential candidate] and the Bourgeois PRD! Forge a Revolutionary, Internationalist Workers Party! leaving only: The Attacks of the PAN [ruling National Action Party] Against Workers and the Oppressed and the Struggle for Socialist Revolution. Their graphic had a headline reading: Attacks of the PAN? What About the PRI [Institutional Revolutionary Party] and PRD? After we pointed out this grotesque falsification to them at the APPO [Popular Assembly of the People of Oaxaca] march in Mexico City on October 9, the IG altered its Internet graphic to show the entire cover page, while still maintaining the headline! Even slander should make some sense. Stalin school of falsification: In top photo, Lenin addresses Red Army troops leaving for Polish front, May 1920. 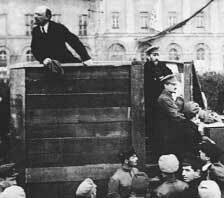 In later version at bottom, Stalinists disappeared Trotsky and Kamenev from platform stairs. Caught in the contradictions between their own politics and what is going on in reality, they resort to lies and slanders, which are the opening steps to encourage and justify violence against political opponents in the workers movement. At the APPO march on October 9, the principal leader of the IG in Mexico—in a calculated provocation to bring violence against us—began to shout to the demonstrators that we defend death squads, which have been responsible for violent attacks and assassinations in Oaxaca and elsewhere. They later threatened to mobilize people to violently oust us from the event, but without success. After consolidating a bureaucratic stratum, Stalin used slanders in an attempt to silence political opposition; when this did not work, he resorted to violence. Writing at the time of the grotesque Moscow frame-up trials against historic Bolshevik leaders, Leon Trotsky observed in a 1937 foreword to The Stalin School of Falsification that the preparation of the bloody judicial frame-ups had its inception in the minor historical distortions and innocent falsification of citations. The IG is not in a position to emulate Stalins brutality, but their lies derive from the same opportunist appetites, political incapacity and desperation. Where do these slanders that we are apologists for labor death squads come from? From our principled defense of the SNTMMSRM miners union against [president Vicente] Foxs and the PRDs state attack! During the miners strikes, we called for the freedom of all the jailed unionists, for dropping the charges against all their members and leaders, including [union head] Napoleón Gómez Urrutia; we called for the victory of their strikes, especially but not only in Lázaro Cárdenas [see Miners, Steel Workers Strikes Shake Mexico, WV No. 872 (9 June)]. For the IG, our defense of Mexican corporatist unions against attack by the bosses and their government, in particular of the miners union, is to defend strikebreaking, and worse: murdering strikers— even lying requires a bit more ingenuity! Assuming their readers are mentally deficient, the IG tries to make them believe that we defend the SNTE [teachers union] national bureaucracy (read: the sinister Elba Esther Gordillo) and the [pro-PRI corporatist union] CROC thugs in Oaxaca against the APPO and the striking Local 22 of the selfsame SNTE. The type of unions the IG likes is exemplified by the municipal workers union of Volta Redonda, Brazil, a cop-infested union led by trade union opportunists determined to protect their own positions. To this end, the IGs Brazilian group dragged the union through the bourgeois courts in 1996, appealing to the capitalist state to adjust the union leadership to their own advantage. Basically as apologists for Latin American petty-bourgeois nationalism, the IGs only niche in Mexico can be as the left opposition within the spectrum of the PRD, which is why they argue that the only real trade unions in this country are those tied to the bourgeois-nationalist PRD, while the PRI-affiliated unions (like the miners and some of the most powerful union organizations in the country) represent the class enemy (El Internationalista/Edición México No. 1, May 2001)! For the IG, the miners union struggle was a settling of accounts within the regime, i.e., a mere quarrel within the bourgeoisie, which in some obscure way affects the workers, and thus there must be mobilizations to reject this frontal assault by the government (El Internacionalista/Edición México No. 2, August 2006). While the IG launches pompous calls for a National strike against the murderous government!, conspicuously absent from all their propaganda is any elementary call for government hands off the miners union, any call for victory to their strikes, any call to drop the charges against Napoleón Gómez Urrutia. A very curious way indeed to defend a strike! Instead, the IG writes, Relatives [of the Pasta de Conchos mine explosion victims] told reporters that the union and the company are the same thing. Surely the bosses have their doubts, after 184 strikes by the miners union in the last five years! IG crops graphic of GEM flyer and Espartaco, portraying GEM as supporters of bourgeois PRD. Caught out, IG revises its Web site to show Espartaco slogans against PRD, while continuing to hide anti-PRD slogans in GEM flyer and maintaining their lie in graphic header. The founding nucleus of the IG came out of our International Communist League a little more than a decade ago. Incapable of dealing with the 1991-92 counterrevolutionary destruction of the USSR and the retrogression in the consciousness of the working class that accompanied this world-historic defeat for the proletariat, they turned away from the hard struggle to build Leninist-Trotskyist vanguard parties to introduce revolutionary consciousness into the working class and lead it to power through new October Revolutions. Facing the gulf between the current forces of Trotskyism and the magnitude of our goals, they deserted from Trotskyism to tail after class forces alien to the proletariat, prettifying and adapting to existing consciousness. To accommodate to Third World nationalism, as the IG does, means capitulating to bourgeois class forces. To give a radical veneer to their anti-Marxist positions, they accuse us of covering up for PRD participation in cases of repression against recent social struggle. A quick look through our press sends their fabrications to the garbage. The IG assumes that their readers would never manage to obtain a copy of Espartaco. The cover article of our latest issue is devoted to combatting illusions in the PRD, including prominently its participation in the police breaking of the [1999-2000 National Autonomous University of Mexico] UNAM strike, in the murderous repression in Lázaro Cárdenas, in Atenco, etc. Stalin also depended on the fact that paper accepts whatever is written on it. The (standard) human mind, nonetheless, is a little more demanding. 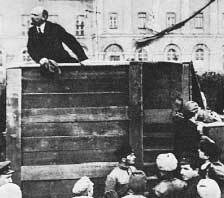 in order to set forth before all his socialist convictions and his democratic demands (Lenin, What Is To Be Done?). Likewise, the IG, embellishing the struggles of the pauperized Bolivian masses last year as a proletarian revolutionary situation, takes great offense at our straightforward assertion that the proletarian instrumentality for overturning capitalism [in that country] has been qualitatively diminished due to the closing of tin mines and a great part of industry. Their search for substitutes for the proletariat has shifted over to Oaxaca, where they have devoted themselves to prettifying the consciousness of the struggling petty-bourgeois masses, presenting the teachers as knowing well that PRI, PAN and PRD are the same (a position the IG had to abandon 13 days later) and conjuring up a revolutionary danger (El Internacionalista/Edición México No. 2). Now they add: We are waiting with baited [sic] breath for the GEM to inform us that in [sic] there is no working class in Oaxaca as well. Well... outside of the service sector, there isnt much. The APPO is an organization based on unionized teachers and the petty bourgeoisie (students and peasants). Its program and outlook are entirely based on illusions in the democratic reform of the capitalist state, looking to the PRD to carry it out. We defend the teachers strike and the APPO against the state and right-wing attacks that they have heroically resisted, and recognize that such struggles can be a spark for broader social struggle; this however does not translate into painting the APPO as something it is not. The IG is incapable of acknowledging that the industrial working class, in any case tiny in Oaxaca, is not a relevant force in the current convulsive struggles of the Oaxacan masses. The Trotskyist perspective of the permanent revolution recognizes that in backward countries, democratic aspirations—such as national emancipation—occupy a privileged position in the consciousness of the working class and the oppressed masses and are a motor force for socialist revolution. The bourgeoisie (whatever its outlook) cannot satisfy the masses, whose only road forward is the struggle for the overthrow of the bourgeoisie and the dictatorship of the proletariat. In 1940, Trotsky explained that due to imperialist penetration, which proletarianizes the native population of colonial and semi-colonial countries, the national bourgeoisie occupies a much inferior position in relation to the development of industry, while the proletariat plays the most important role in the life of the country. Inasmuch as the national bourgeoisie intends to offer any resistance to foreign capital, it is forced to base itself, to a greater or lesser degree, on the proletariat. On the other hand, the governments of those backward countries which consider it inescapable or more profitable for themselves to march shoulder to shoulder with foreign capital, destroy the labor organizations and institute a more or less totalitarian regime (Trade Unions in the Epoch of Imperialist Decay). This essentially expresses the difference between the outlook of the PRD and that of the PAN, and it is why the PRD poses as a friend of the oppressed. The flip side of the IGs accommodation to petty-bourgeois nationalist prejudices is their dismissal of democratic rights, i.e., a renunciation in deeds of permanent revolution. The situation we find ourselves in today, with clear threats of massive repression by the PAN, is in reality a continuation of the campaign against AMLO beginning in 2004. We opposed the desafuero [stripping of political immunity] of López Obrador—Foxs attempt to prevent this popular PRDer from competing in the presidential elections—because it was a transparently anti-democratic attack whose ultimate target was the working class (see Espartaco No. 24, Summer 2005). The IG dismissed the whole thing as an inter-bourgeois quarrel, asserting that the working class had no side. Their oh-so-radical distortions are simply meant to cover their tracks, after they zigzagged violently regarding the PRD mobilizations of recent years, which brought out millions in defense of basic democratic rights, like universal suffrage. 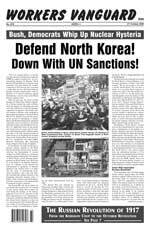 For at least a year and a half, they have said that we are capitulating to the PRD for distributing our communist press at these protests; i.e., for intervening with the perspective of breaking youth and workers from nationalism and winning them to Marxism. And then they suddenly show up at AMLOs National Democratic Convention on September 16! This is obvious, retrospective derrière-covering for not having taken a side with oppressed masses mobilized in defense of their democratic rights. At the center of the IGs politics is their claim that there is a popular front around the PRD since some trade unions support that party. Their recent article includes a list of such unions in order to prove their point, which in fact does the exact opposite. Included in their list is the FNUAS (National Front for Trade Union Unity and Autonomy), a bloc between the UNT [independent National Union of Workers] and...the CROC and the miners union, the very unions that the IG has declared the class enemy! As we have many times explained, the popular front—to which we Marxists are irreconcilably opposed—is not a synonym for any and every case of class collaboration, but rather is a coalition of one or more workers parties with bourgeois forces, generally with the aim of administering the capitalist state. However, to follow the IGs definition is to conclude that there is a popular front in practically every country in the world. For example, in the U.S. the unions are politically tied to the Democratic Party, so why doesnt that constitute a popular front too? The IG is learning fast!